Another dinner with the lovely Clotilde (and the ever lovely Sharon… I am so spoiled). Marron for the ladies entrees, Jamon Iberico and 1 hour poached egg for me… The marron was delicious, the egg interestingly textured, the jamon tasty but overrated given it’s considerable reputation. Mains were a black angus steak with some amazingly meaty oyster mushrooms and a cauliflower puree, an ocean trout with eggplant pur�e and roasted vegetables, and the ubiquitous duck with gai lan. All very satisfying and worth the price. Washed down the lot with a 2005 Joseph Cabernet Merlot Moda (one of my favourite wines, but not the 2004 listed on the wine list). Service left a little to be desired in an overtly fine dining establishment, but that could be because I ask a lot of annoying questions and point out things like the wine being the wrong year. Worth it if you’re up for an experience you don’t mind paying for, and have great company to share it with like I did. Love the atmosphere of communal dining. Everyone sitting on long benches next to groups of other people. Sadly the people sitting next to me didn’t feel the love, and just kind of looked at me strangely when I inquired how their dishes were. The food is simple / rustic (for want of a less abused word) Italian food. Nothing regionally specific as far as I can tell, and far from the “peasant food”, they claim to be making, but all our dishes were delicious. The wine list is extensive and interesting, and remarkably well priced. A bottle of Pio Cesare Barbera D’Alba set me back around $32 (if memory serves me). A shared antipasto plate of vegetables and dips with bread was a nice way to start the meal, and my beef shin parpadelle was exactly the fall apart texture and stringy meaty richness I was after. Mains are definitely on the small side, but I had expected not to enjoy myself, so I was pleasantly surprised by the whole place. Again the service left a little to be desired, I think the waiters were getting into the communal side of things as much as we were, and expected us to order our own desserts. My second trip back to this little suburban gem was supposed to be much better. The new Scottish chef Graham Stewart definitely has a thing for the number three. There’s pork cooked three ways, beef cooked three ways, and salmon cooked three ways. I guess I’ve discovered that I’m just a monogamous kind of guy… because after the first three way it all got a little too much and the excitement was over far too quickly, and I really just wanted one dish done really well. The dishes at Piccolo also bely the name. The entrees are huge ! An order of squid was enough to feed everyone at the table alone, and the crab tian in gazpacho could have swum back to the ocean on it’s own. Still, the food is generally good, well priced, and with no wine list, it’s a byo paradise. I’m hoping at my next visit it will spring back to it’s best. Simple and tasty Japanese food. Ha Lu has done a great job at making a relatively soulless / odd shaped little restaurant into a warm, inviting space. The menu is set out like an izakaya in that the dishes are small plates designed to be shared. Unlike most izakaya you will find in Japan however, it isn’t full of salary men getting morbidly drunk after a hard day pretending to work. Rather they focus on the food, and the clean flavours that make Japanese food so good. We started with fresh sashimi of tuna, salmon, and kingfish, moved on to pork belly kakuni, sliced duck and eggplant, agadashi tofu, dorper lamb cutlets with fried camembert, ramen, and rice. “I think you have ordered… a little bit too much”, our waitress politely but insistently suggested… so I cut the ramen to make her feel better. All the dishes were superb…the sashimi fresh and succulent with just a dash of wasabi and soy, the standouts for me being the pork belly (in which I have a vested interest), and the duck. Word of advice though… DO NOT ORDER DESSERT. I was foolish enough to order a chocolate parfait (I know, I know… what is a parfait anyway??). I could see our waitress toiling for a good 10 minutes before presenting me with a monstrous concoction of (I kid you not), ice cream, cream, crushed oreo biscuits, cocoa pops (! ), pocky sticks, and ice magic… Such a sad way to finish an otherwise great meal. Proof that you can not take friends to a restaurant you plan to review. Good friends will improve the experience of any bad restaurant by an amount completely undeserving of certain establishments. Brad and Nat are such friends, and Basil Leaves is well and truly one of these restaurants. The atmosphere was non existent outside of the sparkling repartee of our group of comic geniuses (and Brad). The toilets a near hazardous waste area, the food a clever mixture of every kind of Asian you can think of. At last count there was a total of 6 separate ethnic regions represented in all their generic glory. As Nat so aptly put it… It’s not often you come across a restaurant bold enough to put all their faith in iceberg lettuce. But Basil Leaves perseveres. If you’re feeling like Indian/Thai/Vietnamese/Chinese/Malaysian/Japanese or “other”, it may well be the place for you. What can I say about Suraj ? Ever since being introduced to it by my good friends Ben and Jen, it’s been a regular place for dinners of both the rowdy and refined version, a point of reference to every other Indian restaurant I’ve been to, and a wonderful example of food that is honest and simple and good. Suraj is run by Roger, and his wife Susan (get it… Su-Raj). It’s also convenient that Suraj means “Sun”. He’s been in business for close to 15 years in the same spot, and I’m willing to bet that the menu hasn’t changed a hell of a lot in all that time either. Suraj is not so much a restaurant but an institution of traditional Indian cooking, often dwarfed by it’s elaborate and decadent neighbours in the ever trendy Highgate strip. But while places like Jacksons, Veritas, Must, and Soto try to ooze style and charm, and fancy looking Indian chain restaurants start up across the road promising glitz and glamour… Suraj is unchanging in it’s quaint approach to no frills dining. So after yet another great night of dining there with a group of friends and curry lovers. I thought it best to put something online about this place, as it is sorely under represented in the high stakes (steaks?) world that is the Perth restaurant scene (which may or may not be an oxymoron) . Of course I can see why it would be easy to overlook Suraj. The decor is drab (and that’s being polite), the florescent lights normally flickering overhead are more reminiscent of a hospital waiting room than a restaurant… and when there is more than 2 people in the place it’s almost impossible to hear anything over the resounding din caused by a complete lack of sound insulation. But really… does any of that matter ? (Feel free to skip that question if your favourite restaurant is the Witches Cauldron, because you clearly enjoy spending stupid amounts of money on bad food, for the sake of supposed reputation). Roger makes regular pilgrimages back to India to refill his spice coffers with the right quality of stock to use in his exacting recipes. Garam Masala is all ground by hand and even though I reckon I’m a dab hand at making the odd curry at home, Roger said it’d take me at least 3 years working full time to be able to reproduce any of his… which I will reluctantly concede may be true. The menu is simple and consists of a number of curry dishes that for once actually taste different to each other. 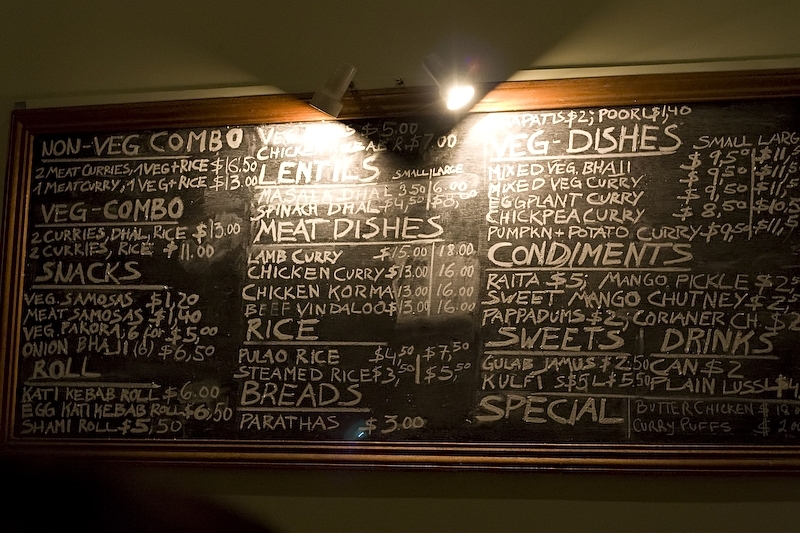 I can do no more than to point you to the blackboard above which is in essence all he does, aside from the occasional goat curry that manages to slip its way onto the menu depending on what his Halal butcher has in stock. Highlights for me personally are the chickpea curry, the masala dhal, the beef vindaloo, and the magnificently airy pooris (or puri, i’m not really sure which, but i’ll go with what’s on the menu). The great thing though, is I can turn up to the place whenever I want, regardless of how late it is, and know that if people have already ordered I will love everything that comes out. Suraj is not the kind of place to go if you’re in a hurry. Something I had to get used to the first time I went. But given the nature of the food, and the atmosphere of the place, I’m not sure you can rush things without losing some of the magic. Certainly the look on Rogers face when a large group of people all come in at once is a little troubling… but when the food arrives all is well and right in the world. On a sad note however. It seems that this little slice of Highgate history may not be too long for this world. The owners of the building are planning to take the shop back over within the next few months, and according to Roger, turn it into one big restaurant / bar combined with the shop next door. I asked if he’d be moving elsewhere and it doesn’t sound like he has the energy to start from scratch all over again. So the days of simple Indian pleasure Suraj style may be numbered. If you haven’t been yet, then do yourself a favour. Get a couple of good bottles of wine, a few close friends, and swing by Suraj for a taste of food the way it should be made… from the heart. At a recent Perth blogger meetup I ran into Kay, who raved in a nonchalant but cooly excited way about Italy Home Made, a little pasta bar on Charles St in North Perth. I know the place pretty well, although in its former incantation… Poppies. Poppies is a cute little cafe tucked into a small group of shops, along Charles St in North Perth, a few streets before you get to Scarborough Beach Rd. We used to duck in there for late breakfasts and early lunches on the way back from the city on a Sunday afternoon or morning, and always managed to find a decent coffee and tasty meal. Well Poppies is still there, but they have now extended the shop out to twice the size, and turned one half of the place into “Italy Home Made”. Basically a DIY pasta bar whose main angle is that all the pasta is made fresh on the premises daily. So one afternoon last week I happened to be driving by and thought… I must just try this new place that Kay was raving about. Never one to turn down a good recommendation (until the day someone recommended Fasta Pasta to me that is), I decided to head in and check it out again. Then you choose what you want to have on it. I chose Atlantic, which was a creamy sauce mixed with smoked salmon and capers. Then the dude goes away and collects all the bits he needs, drops the pasta into some water and puts the sauce and toppings into a pan, and then combines it together. Toasts some little bread rolls for you and puts some grated parmesan into a little cup. It was pretty quiet when I went in, and I had my meal (which was a large, and there was a lot in there) in around 10 minutes, which is pretty good for food of that quality. The pasta was nice, the sauces complimented well, and the fillings were very tasty. I’d still like to know who decided that smoked salmon and capers were the perfect combination for each other though. I’m imagining some big conference where all the foods get together and have some kind of speed dating face off to work out who should is right for one another… Salt and Pepper clearly hit it off, Olive oil and balsamic vinegar were drawn together by their differences, and poor little Anchovy sat alone in the corner, in a pile of his own salty tears. Italy Home Made is a great cafe with top food that will serve you well for a quick lunch, easy dinner (they are open in the evenings til quite late and are BYO wine with no corkage), or “I can’t be stuffed cooking but don’t want some crappy fried chicken type meal” takeaway solution. Check em out.